Let’s face it, what kid doesn’t like candy? And, frankly, it can be an inexpensive way to fill an Easter basket, especially if you visit the bulk candy section. But if you’re like me, you’d rather just have a sprinkling of sweets and round out the basket with other, non-sugary stuff. Fortunately, with a bit of creativity and a bit of thinking outside the basket… eh… box, you can create a beautiful, colorful and inexpensive basket that any kid would be grateful to find on Easter morning! Craft supplies are colorful, fun and can be found at reasonable prices. Visit thrift stores, dollar stores and discount department stores to find things such as felt, fun buttons, glitter glue, popsicle sticks and more. Whether it’s a prepackaged craft project or just a collection of fun craft stuff, it’s also the promise of more fun later to come. Treat them to the unexpected. While stuffed animals—particularly bunnies—are traditional, most kids already have an overabundance of these. Instead, consider stuff they can actually use up such as bubbles, bubble bath or fun-shaped soaps. Novelty key chains, colorful crazy straws, stickers and fun bandages are other great, easy-to-find and cost-effective options to tuck inside. Practical stuff can be fun to fill up the basket too. Pretty hair accessories for a little girl are colorful yet an unexpected inclusion. A new pair of socks can be rolled up to look like an egg. (Consider tucking a new toy car or plastic ring inside as an additional surprise!) The travel section of any discount department store can be an inexpensive treasure trove of ideas, too. Lip gloss or lip balm, small bottles of fun scented body spray or travel sized lotion for a young lady are all fun, but untraditional ideas. Need more ideas? No doubt, whenever you enter any store this time of year the decorations and signs will automatically point you in the direction of the seasonal (Easter) section. Go ahead and visit, but don’t forget to check out other areas, too, for more ideas and to save more money! Take a stroll through the party section of any discount supply store for inexpensive, trinket toys. Visit the greeting card aisle for packaged stickers. Stroll through the stationary aisle for fun pencils and erasers. (Psst! While there, pick up a small package of blank labels. They’re not just labels, they’re “create-your-own-stickers”!) Lastly, ever looked at bubble gum machines lately? Some of them feature some admittedly pretty cool toys! 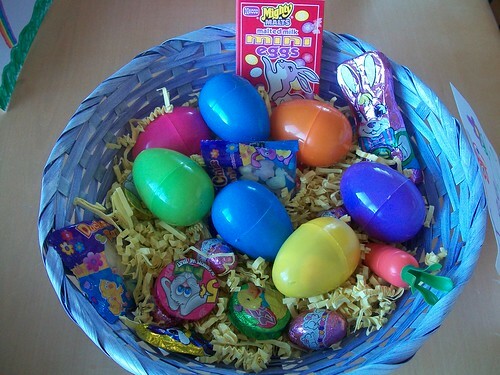 For anywhere from 25 cents to 50, you can snag quite a few fun things to tuck inside colorful, plastic eggs! Thanks for giving me some more ideas. We aren’t a huge fan of candy either and you have given me a few more ideas. It is sometimes hard to look past the traditional Easter ideas. Bubbles and bath beads are the two that will probably end up in the basket this year.